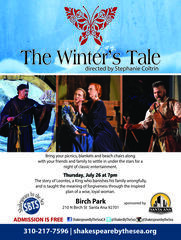 Join us for a free live performance of William Shakespeare’s highly acclaimed The Winter’s Tale at Birch Park on Thursday, July 26, 2018 at 7:00 p.m. The outdoor performance will be presented at Birch Park, located at 400 W. 3rd Street in Santa Ana and will be presented by the talented Shakespeare by the Sea Theatre Company . The Winter’s Tale depicts the story of a King Leontes who suspects his wife Hermione is being unfaithful and makes the brutal decision of banishing her. In a flash, King Leontes loses all that he holds dear and realizes his mistake a bit too late. But is it too late for a miracle? Perhaps what was once lost can be found. The performance begins at 7:00 p.m. but the public is encouraged to arrive 30 minutes prior to obtain their spot. Public Parking is directly adjacent to the park. The public is welcomed to bring their own chairs, blankets and picnics or pick up dinner before the show from their favorite local Santa Ana eatery. Join us for a dramatic night of theater under the stars!